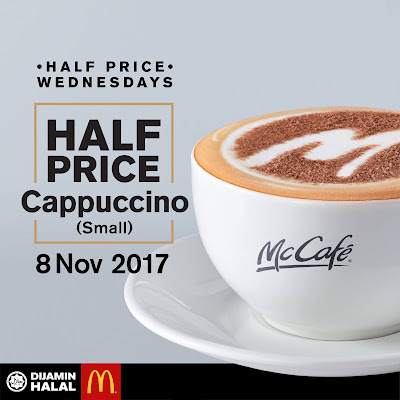 [McCafe® Half Price Wednesday 8 Nov 17] Yes! HALF PRICE WEDNESDAY is back! Enjoy a McCafe® Cappuccino (Small) at half the price on 8 Nov 17. Just show this Facebook post to our barista at your favourite McDonald’s® Malaysia restaurant to enjoy the offer. It’s that simple! Changes to terms applicable to all.